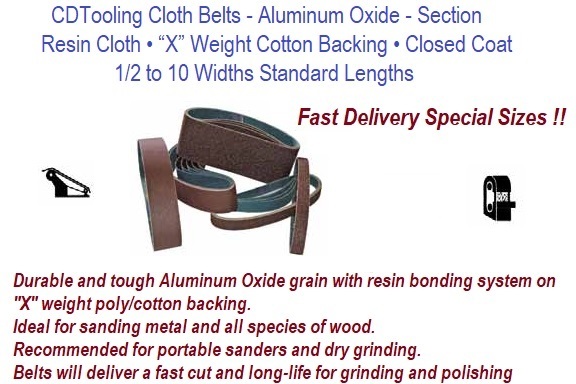 Durable and tough Aluminum Oxide grain with resin bonding Recommended for portable sanders and dry grinding. 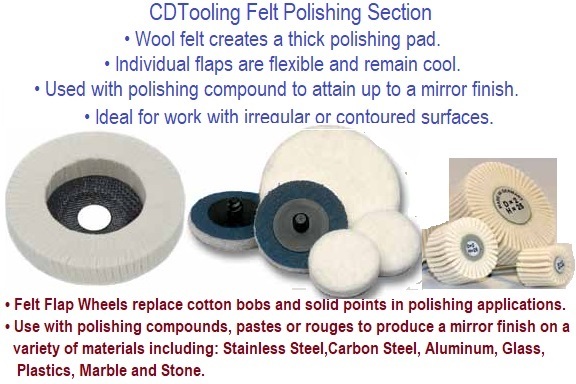 Wool felt creates a thick polishing pad. Individual flaps are flexible and remain cool. Used with polishing compound to attain up to a mirror finish. Ideal for work with irregular or contoured surfaces. Use with polishing compounds, pastes or rouges on a variety of materials including: Stainless Steel, Carbon Steel, Aluminum, Glass, Plastics, Marble and Stone. • Provides aggressive polishing, blending and finishing action. • Designed to minimize heat buildup. • Excellent for cleaning and polishing soft metals prior to plating. • Finishing the surface of aerospace turbine blades. • Remove oxides, rust and weld discoloration. • Equivalent to 3M Scotchbrite EXL. • Use on ferrous, non-ferrous, stainless, extrusions and plastics. These products are often referred to as “Scotch Bright®” or three dimensional abrasives. Abrasive grains are bonded to flexible nylon fibers, which provide a controlled, consistent finish. The “open weave” construction provides a continuous supply of new grain when fiber and old grain wear away. The flexible “spring-like” design reduces the chance of undercutting or gouging the work piece. 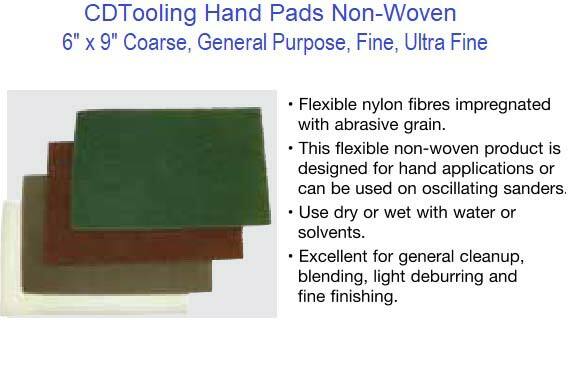 Flex-N-Finish– Non-Woven clean & finish products are generally hand-operated. They are not as strong in nature as other non-woven products because less grain, fiber and resin are used in their production. Clean & finish products generally include hand pads, sheets and rolls. Heavy Duty & Hi-Strength Flex-N-Finish– HD & HS Non-Woven clean & finish products are designed for machine use and can handle higher RPM’s. They are made with stronger nylon fibers and additional resin. They are not as strong as surface conditioning products, but they can be ganged together is disc form to remove burs, particularly on threaded parts. They are also great for applying a consistent satin finish on irregular shaped parts. The finish will be consistent on part-after-part. Surface Conditioning– Surface conditioning refers to the changing of a product’s surface, without removing or damaging the base material. These products are used in mechanical operations and include discs and belts. Flex-N-Strip Products – Extra coarse silicon carbide grain is bonded to stiff extruded nylon fibers with a flexible resin. They are excellent for removing coatings from wood, metal and plastic. Also effective at paint & rust removal. Convolute Wheels – Formed by wrapping and bonding web material impregnated with abrasive grain and resin around a center core. Because they are “wrapped”, they must be run in the direction of the arrow printed on them. 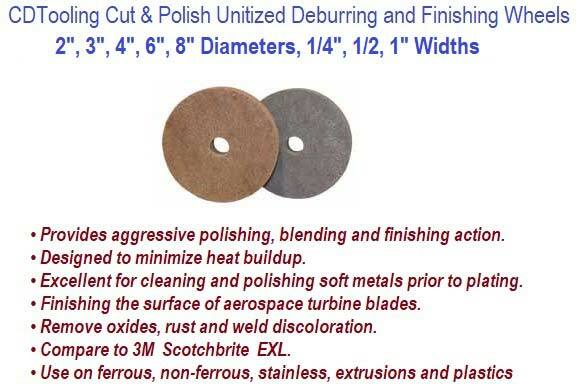 Very effective on a variety of deburring & polishing applications. Unitized Wheels – Formed by pressing web material impregnated with abrasive grain and resin into a slab. Wheels are then cut from the slab. These products can be run in either direction, so they do not have directional arrows printed on them like convolute wheels.